Of the many time-saving and money-saving features built in to Working Church, our complete church management software solution, what may be the quickest payback for you lies in the ability to print photographic membership directories on your computer. Imagine for a moment...the freedom, the convenience, the flexibility of printing your own pictorial church directory...on demand. On your schedule. When you want a directory. Imagine, too, the ability to print church directory "updates" whenever needed. Again, when you want, or need, to print one. If you would rather not actually print the church directories yourself, you could simply email your formatted, finished pictorial directory pages to your local copier store and let them do the printing for you. (Staples, Walmart, Walgreen's). You are free from scheduling around photographers or having your members pressured into buying photographs they might not want or need. Our church software does it all for you. All you have to do is supply the pictures. Think how the money you save from producing just one church directory could easily more than pay for this church management database software. Click on the links below for examples of some of the many types of church pictorial directories that can be printed using your own computers and printers ... for free ... when you use Working Church our church management software. Note: the sample church pictorial directories above require Adobe Reader® to view. Also, they may be slow to open, depending on your internet connection speed and/or internet usage. This is not an indication of how fast the software will work on your own computer or network. 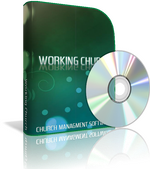 A free, fully-functional demo of Working Church: church membership software is available for download. Click either the image, or the link, below for instant access to the demo. Click here to get your free demo of Working Church. If you prefer, you may order the demo on CD. All we ask is that you help us keep our software prices as low as possible by paying shipping & handling costs. You do not need a PayPal account to place your order. You may also contact us by mail at: Brothers in Christ Software, 760 Piney Grove Church Road, La Grange, NC 28551.